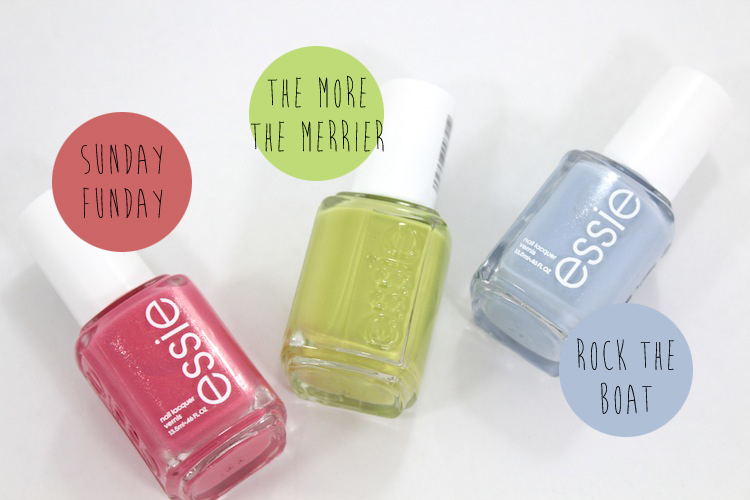 The other day I picked up a few shades from Essie's Summer 2013 Collection. There are so many fun & bright shades, I'll probably go back for the rest of the colours. I picked up The More the Merrier, Sunday Funday, and Rock the Boat. Today, I'm wearing the coral shade in the collection, Sunday Funday. It's described as a "tangerine crush coral with soft shimmer." It's definitely an orangey coral, but it also pulls a little pink. The silver shimmer is fairly noticeable on the nail (even though it doesn't show up that well in this photo). Application was easy -- the formulation isn't too thick or thin. It took two coats for an even finish. I can't speak on longevity yet, but I will say that I've already chipped a nail. Don't you just hate when that happens? Hehe, cute name! I am curious to see what "The More the Merrier" looks like on you because I think your skintone would suit the colour.